Who is Torii Wolf? Nah...for real who is she? Cause I've never heard of shorty. But recently word gets to ear that Primo's producing her entire album (turns out her did 9 outta 15) so now ya'll know I'm interested to find out who she is and what these two have on tap. And with Preem coming off of his best work of the past 17 years in my opinion with him & Royce's "PRhyme" album ya'll know I'm all in to see what he has on tap for her album "Flow Riiot." 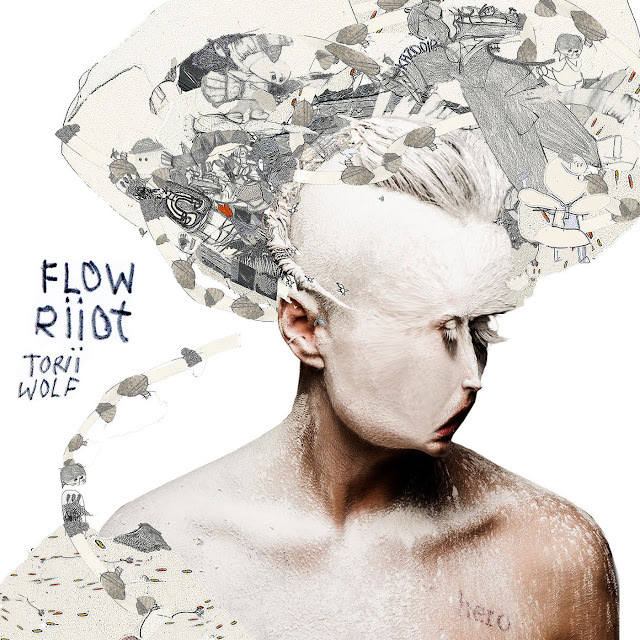 "Flow Riiot" sets off with "Everlasting Love" which is dope and has Preem freaking the vocals from "California Dreaming" that he used for Gangstarr's "Check the Technique" while "Meant To Be" has Torri trying to figure out what's the equation she needs to get her love reciprocated and the album's 1st single "First" has Preem using an ill Dilated Peoples sample "I've see the last come first, I've seen the first last" and has Torii asking "you fell in love with me first, so why are you running away?" "Big Big Trouble" has a dope string samples and has Torii warning folk to say away from falling in love a la Erykah Badu with her cause she's trouble, the araabMuzik produced "Body" slows things down and takes me back to the vibe of the Sneaker Pimp's "Becoming X" album and "I'd Wait Forever and A Day" has a dope jazz feel to it that Digable would've sampled back in '92 and has Torii telling her lover that she's not going anywhere, anytime soon. The LEGENDARY King of Chill produced "Take It Up On Monday" is dope as hell but what's even doper is seeing my guy's name back in some linear notes! "Go From Here" has Torii questioning whether she should stay with her lover or be audi 5000, "Shadow Crawl" gives you that vintage Primo feel while "Nobody Around" and "You're Not There" both come through in 4th quarter like Durant in the '17 finals and "Where We Belong" has Torii telling her lover that dude needs to get back inside her arms not now but right now like Phife said. "Free" featuring Macklemore produced by King of Chill takes the tempo uptown and actually has Macklemore sounding dope (what can I say? I've never been a fan of dude) and Preem scratching "freedom is a road seldom traveled by the multitudes" made famous by PE's "Show 'em What You Got." The Rob Zombie produced "Pain Killers" is bonkers and "Moscow" ends the album on a solid note and embodies everything she's been singing for the entire album by telling her lover to "take me wherever you go" over a beautiful acoustic guitar. It's been a minute since Preem was in his R&B bag for an entire project. In fact, we'd have to go back to '06 when Preem handled the bulk of production for Christina Aguilera's "Back to Basic." But the dope thing about Preem is with over 30 years in the game he's taking GZA's advice and "diversifying his funds" with who's he's working with. Cause Tori's flava is mos def a sidestep from Preem's regular steez and sound but don't get it twisted, that's a VERY good thing. Cause even though "Flow Riiot" is nothing like we've ever heard outta Preem's MPC before you can best believe this is just another BANGER under his belt and even though it might not be what you're used to hearing, who cares as long as it's dope right?